Already one of the poorest countries in the world, and still recovering from the devastating 2010 earthquake, Haiti faces a major rebuilding effort following the destruction caused to communities, lives and livelihoods by the strongest hurricane to hit the country for decades. 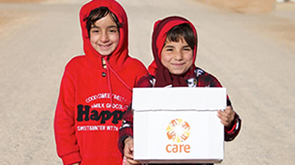 CARE was among the first relief organisations on the ground distributing aid in the South-East and the Grand Anse departments, the hardest hit areas of the country. We provided emergency shelter materials, food, water and hygiene kits, and will be providing long-term support to local communities to help them recover and rebuild. water supplies contaminated by flooding with hundreds of confirmed cholera cases – proper hygiene is critical to help contain the spread of the disease. rebuilding roofs and rehabilitating sanitation facilities in six schools in Grand Anse. We will continue to coordinate closely with the government and UN community to scale up our response to meet the immediate needs of affected people. This will be a long-term response that will take years for the Haitian people to recover from, but Haitians are resilient and are eager to rebuild their lives. CARE has a strong history of working in these communities, and we will be partnering with the Haitian people to help them rebuild their own communities.